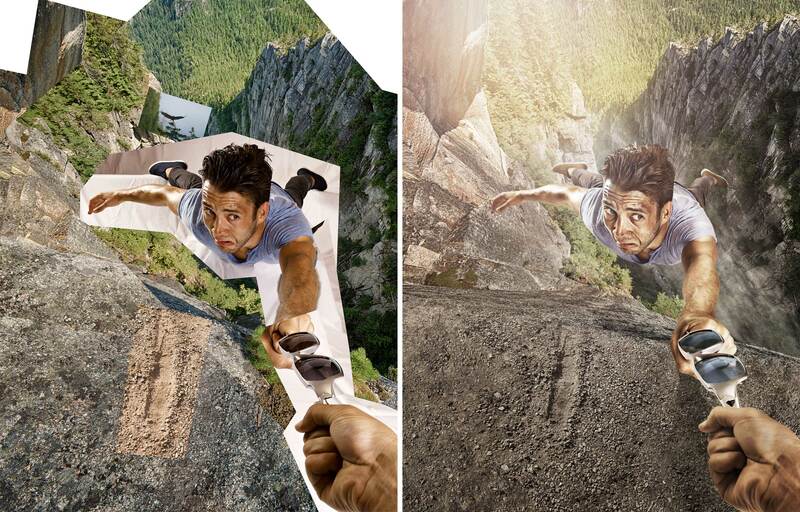 Working with photographer Waldy Martens on this image, we concluded that the most dramatic angle to depict this fellow dangling off the edge of this cliff was from a top-down view. Waldy photographed the model lying on his stomach with his feet propped up on beams behind him, all covered in white drop cloths for easy masking. We were asked to increase the drama by adding some clouds below the model, as well as an eagle flying below. We were able to find an image of an eagle angled up to land on a treetop to approximate a view down on one from above. To increase the drama further, we also liquefied his head slightly larger and feet slightly smaller to exaggerate the perspective.